Zalura is an 18 year old Changeling Witch/Harrower from Ustalav. The changes would be her hair is black and is straight. It hits about mid-back on her. Also, her eyes are one deep blue and the other is a forest green. Her clothing is Varisian traveler type, with a red bladed scarf as her favorite weapon. She also has a blue and purple butterfly tattoo on the back of her left shoulder (she is a follower of Desna). She is very laid back and friendly, and quite enjoys fortune telling. 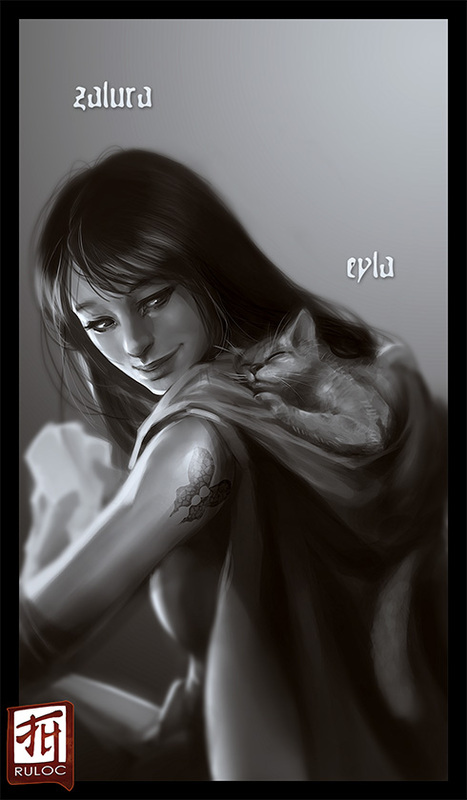 Her familiar is Eyla, a silver short-hair tabby cat with green eyes. The cat enjoys riding on her shoulder or sleeping in the hood of her dark green cloak.